Parents are often frightened and overwhelmed when a health professional announces their child has a diagnosis of an “eating disorder.” Parents wonder how involved they should be in helping their child – should they stand back and allow their child to navigate this difficult time by themselves? Or should they roll up their sleeves, and start preparing and supervising their child’s every bite? Their independent child might proclaim that they “have it under control” and parents might want to desperately allow that, but as they watch their child chop the apple even smaller and push their food around even more, they realize quite quickly, that their child does not have this under control at all. Parents are best equipped to help their child fight against this terrible disease, and can help their child successfully, right at home, in a way that is safe and effective. This approach, is known as Family-based Treatment (FBT) and is the most researched and effective method for eating disorders treatment to date1-3.It is the leading outpatient treatment for adolescents with eating disorders, and is generally considered to be the first recommended line of treatment. With this approach, parents are initially asked to take charge of their child’s nutrition entirely: meal preparation, grocery shopping, and all choices regarding food planning, in the face of their child’s clear inability to do so, “for now.” Parental involvement can prevent the child from requiring a higher level of care such as a partial hospitalization – or inpatient program (these programs can sometimes become necessary if the child’s eating disorder behaviors cannot be interrupted). Historically, FBT did not include a dietitian. With the help of an FBT-certified therapist, parents are empowered to tap into their parental instinct, and to feed their child what they know their child needs in order to restore health. The presence of an “expert” or a “meal plan” was thought to disempower the parent. Although parents know best what their child needs, feeding a child with an eating disorder is not intuitive for most. The caloric requirements necessary to accomplish this task can be 2-3x that of the child’s baseline, making this task challenging, even for the most nutritionally savvy parent. Second, malnutrition makes refeeding and weight restoration challenging – a child will feel bloated, constipated, overly full, and the eating disorder will negotiate every bite – “chicken over steak” or “brown rice instead of pasta” making mealtimes exhausting. Parents often express feeling confused, overwhelmed, and quite frankly, stressed. Their questions include: How do we start? How do we navigate these challenges? Are there tricks to ease the physical discomfort associated with malnutrition? How long does it take to get better? How far apart should we space the meals? How big should the meals be? Is it okay if our child eats brown rice every day, as long as she is eating…? As registered dietitians with over 30 years of combined experience treating eating disorders in adolescents, we have written a book entitled, “How to Nourish Your Child Through an Eating Disorder: A Simple Plate-by-Plate Approach to Rebuilding A Healthy Relationship with Food,” to address these concerns and questions raised by families undergoing FBT who are seeking additional guidance. We have developed the “Plate-by-Plate Approach” to help parents navigate the high-calorie demands of malnutrition and weight gain, while helping them reacquaint their child with foods they used to love. No measuring or counting is involved. We find this approach is helpful at a time when kids are facing the challenge of reducing their obsessiveness with numbers and their rigidity, while working on becoming more flexible with food. In time, this approach eventually provides for a seamless transition back to normal eating. 3) There is an emphasis on variety and exposure to all foods from the start. 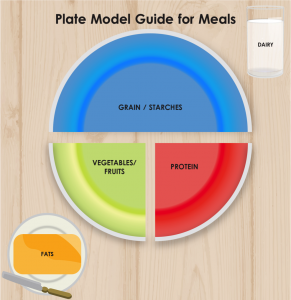 The Plate-by-Plate approach is designed for use with all eating disorder diagnoses, and can be adapted to accommodate each individual’s nutritional goals. Through use of the following visual as well as photos of example plates, parents are guided to feed their child 3 meals and 2-3 snacks per day without ever taking out the measuring cups. The plates can be adjusted as the needs of the child change throughout treatment – increasing during times of weight restoration, and decreasing once the child hits their target weight range. The book provides ideas for how to adjust the plate based on individual nutrition goals and needs as well as ideas for how to make mealtime more successful for everyone involved. Parents are encouraged to include a variety at all meals and snacks to increase their child’s comfort level with food. Weight restoration and resumption of menses are important, but by themselves, are not enough – the work must continue in order for the child to successfully rebuild their relationship with food. Encouraging variety helps to excavate remnants of eating disorder thinking, all while shaping the child into a confident and fearless eater. We ultimately want kids to be able to eat cake on their birthday (and their friend’s birthdays too!) without having an intense escalation in anxiety, eat in restaurants, travel and have pizza with their friends. To follow the Plate-by-Plate approach, parents are encouraged to begin plating balanced meals, according to the diagram below, and to fill 100% of the plate. Parents should choose a meal schedule of “3 meals + 2 snacks” (or “3 meals + 3 snacks” if the child is already successful with “3 meals + 2 snacks”), and stick to that meal timing each day. The child may negotiate for a plate that is mostly fruits and vegetables but parents should be aware that a high fruit/vegetable plate will likely contribute to increased gastrointestinal distress and bloating. A plate that is too high in protein, as some kids might request, will likely cause increased fullness, making it difficult to complete the rest of the meals that day. The Plate-by-Plate approach is a simple and effective strategy to help with the nutritional rehabilitation of adolescents struggling with eating disorders. Parents can use this approach, alongside FBT, for additional nutrition guidance. Ultimately, parents have the final sign-off for how they choose to plate the meal. If the plate looks good, even if it’s not quite matching our suggestions, that’s okay. While FBT offers parents a general map to follow during their child’s nutritional rehabilitation, the Plate-by-Plate approach adds a compass, both pieces integral in navigating the tricky terrain of eating-disorder recovery. The exact route taken, however, is still very much in the hands of parents. Parents are empowered to lead their child through nutritional rehabilitation and eventually transition to normal eating. 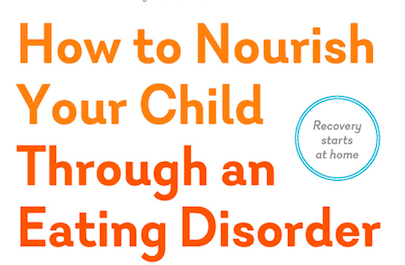 For more information, this approach is detailed in the book, “How to Nourish Your Child Through an Eating Disorder: A Simple Plate-by-Plate Approach to Rebuilding a Healthy Relationship With Food,” available on Amazon. This approach has been featured in the Journal of Nutrition and Dietetics in an article entitled, ” “The Use of the Plate-by-Plate Approach for Adolescents Undergoing Family-Based Treatment.” And for more information about plates, encouragement and support, follow Wendy and Casey on instagram @platebyplateapproach! Lock J, Le Grange D. Treatment Manual for Anorexia Nervosa: A Family-Based Approach. 2nd ed. New York, NY: Guilford Press; 2015. Lock, James. “Evaluation of Family Treatment Models for Eating Disorders.” Current Opinion in Psychiatry, vol. 24, no. 4, 2011, pp. 274–279. doi:10.1097/yco.0b013e328346f71e. Wendy Sterling is a Registered Dietitian and a Board-Certified Specialist in Sports Dietetics. She is the co-author of “How to Nourish Your Child Through an Eating Disorder: A Simple, Plate-by-Plate Approach to Rebuilding a Healthy Relationship with Food.” ” and “No Weigh! A Teen’s Guide to Positive Body Image, Food, and Emotional Wisdom.”She worked at The Healthy Teen Project as well as the Eating Disorder Center at Cohen Children’s Medical Center of New York. She has been published in the International Journal of Eating Disorders and theJournal of Adolescent Healthfor research on osteoporosis, menstruation, and metabolism. She will also be published in the Journal of the Academy of Nutrition and Dieteticsfor her work with the Plate-by-Plate Approach Fall 2018. She is team nutritionist for the Oakland A’s. Casey Crosbie is a Registered Dietitian and a Board-Certified Specialist in Sports Dietetics. She currently serves as program director for the Healthy Teen Project in Los Altos, CA and is co-author of How to Nourish Your Child Through an Eating Disorder: A Simple, Plate-by-Plate Approach to Rebuilding a Healthy Relationship with Food.” Casey previously served as lead dietitian for the Lucile Packard Children’s Hospital Comprehensive Care Program for Eating Disorders at Stanford. She was published in Nutrition in Clinical Practiceand in the Journal of Adolescent Healthfor research focusing on refeeding syndrome in adolescents with eating disorders. She will also be published in the Journal of the Academy of Nutrition and Dieteticsfor her work with the Plate-by-Plate Approach Fall 2018. Similar to eating a healthy diet, being fit and exercising regularly attracts praise and admiration in our society. All too often, however, these lifestyle changes can shift from being mindful, balanced, and healthy to being all-consuming, obsessive, and harmful. It is important to understand the intent or motivation to exercise. Exercise that is completed to focus on altering weight, and shape, or “burning calories” might be of concern. Instead, ideally one would focus on the benefits that come with exercise such as improved energy, mood, and sleep. Exercise should be enjoyable and energizing, not completely exhausting or painful. In a healthy relationship with exercise an individual should be able to vary the intensity of workouts, meaning that training can occur at a lower intensity some of the time and more intensely at others. Someone who is compulsively exercising may only know and exhibit one gear—high intensity, or near maximum effort—during workouts. They may struggle with a fierce adherence to rigid exercise routines, whereas those who exercise mindfully, can be more flexible. For example, if it’s cold and raining outside, a balanced exerciser may decide to skip a run and opt for a cup of tea and a good book by the fire. Conversely, a compulsive exerciser will go out in the cold and rain, perhaps in the early morning hours when it’s still dark out, to run miles and miles anyway. 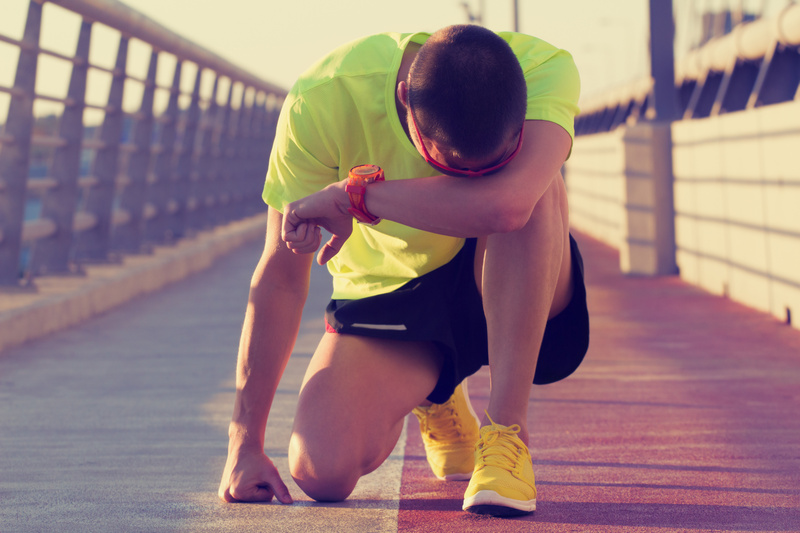 While following a balanced diet, an individual who exercises moderately will often see incremental performance gains, whereas an individual who exercises compulsively will likely experience a decline in performance over time. You are able to listen to your body and respond appropriately. This might result in feeling up to moving some days and feeling as though rest is needed on other days. You participate in activities with internal goals like the expectation of fun versus external goals such as weight loss. You see your exercise as flexible, meaning that you might need to adjust your workouts when school, social, or family commitments arise—for example, you don’t expect to workout four days a week during finals. You allow your body to rest, knowing that rest will not diminish your desire to exercise on other days. You eat enough food to adequately fuel your level of activity. Exercise changes with the seasons (for example, in the rainy season you may increase yoga and decrease soccer). The gym is on fire but you have two minutes left on the treadmill, so you stay on. You feel anxious if you don’t get to do your workout on a particular day. You think of working out as a way to make up for what you ate. You work out even when you are sick, injured, or tired. You are working out to delay physical changes to your body. You work out for external goals only (physical appearance). You work out in odd places at odd times. You don’t eat enough for the energy you are expending. Your family or friends have expressed concern that you are exercising too much. You force yourself to exercise even when you do not feel like doing so. You often miss out on attending social or family gatherings as a result of your workouts. To assess if you have an unbalanced relationship with exercising, feel free to check out the Compulsive Exercise Test from Almost Anorexic. If you find that several of these warning signs apply to you, it is recommended that you seek professional help to better understand your relationship with exercise and to explore how you might be able to be more flexible and spontaneous. A summary of how mindful exercise differs from compulsive exercise can be seen below. Thank you to Kate Bennett, PsyD, Sport Psychologist (2017), who has give us permission to use this in our book. The above blog was adapted from “How to Nourish Your Child Through an Eating Disorder: A Simple, Plate-by-Plate Approach to Reestablishing a Healthy Relationship with Food,” and “No Weigh!!! A Teen’s Guide to Body Image, Food, and Emotional Wisdom. This post is an adapted excerpt from Wendy Sterling’s book in progress, “How to Nourish Your Child Through an Eating Disorder: A Simple, Plate-by-Plate Approach to Reestablishing a Healthy Relationship with Food.” This book is co-written by Casey Crosbie, RD, CSSD, Lead Dietitian at the Healthy Teen Project, and forthcoming by The Experiment publishing house Spring 2018. Though not a formal eating disorder diagnosis, orthorexia refers to those who have become excessively preoccupied with “eating healthy” and “eating clean,” to the point it disturbs the flow of one’s life. Orthorexia refers to someone who will “only eat” brown rice and not white rice, or only eat organic, cage-free, grass-fed, free-range foods. Someone with orthorexia may have an eating disorder or may not; there tends to be a focus on “quality” vs. “quantity” and a focus on “health” vs. “losing weight.” And in a world of quinoa and soba noodles, it’s easy to blend in. But there is a difference between someone who has an allergy or a “preference” vs. someone who is hiding behind those things because they are actually scared to step out of their comfort zone. With the influx of health messaging, orthorexia has become increasingly common but can be very debilitating, especially for teenagers. Kids who are looking to “become healthy” are attracted to this messaging yet an extreme adherence to these messages can, ironically, cause kids to become unhealthy both physically or psychologically. Consequences of orthorexia include increased irritability, depression, anxiety, poor relationships with others, social avoidance, feelings of guilt, and an excessive amount of time spent thinking about and/or preparing meals, taking time away from other activities. Teens who are restrictive and maintain strict guidelines for what they will or will not eat continue to be restrictive years later. They struggle to eat pizza with friends, eat in restaurants, and attend even basic social events like football games or concerts because “there is nothing for me to eat there.” I have worked with kids who have packed measuring cups with them when traveling (highly discouraged, and in fact, is sign that the person is not ready to travel). I have had clients bring “their food” to birthday parties and other events. This immediately makes you seem different and becomes just another way that eating remains difficult and “front and center” in your life. Below are some characteristics typically seen with orthorexia. Some people may have 1 or 2 of these behaviors/beliefs around food, but with orthorexia, a person usually exhibits most, if not all, of the behaviors below. Do you sort foods into good foods and bad foods? Someone with orthorexia (or even a chronic dieter) categorizes foods as “good” and “bad.” “Good foods,” also known as “safe foods,” are typically foods a person considers to be “good” or “healthy.” Examples of safe foods may be fruit, yogurt, vegetables, chicken, and fish (and will vary per person). Conversely, fear foods are foods that feel “scary” to eat. You may label a food as “fattening” or “disgusting,” “unhealthy,” “gross,” or “too high in sugar.” Fear foods might include potato chips, ice cream, cookies, cake, brownies, and candy. Typically, those with orthorexia, show a lack of variety at meals and snacks, not only throughout the day, but also throughout the week. If you keep a seven day food record, logging all meals and all snacks, how good is your variety? Are you eating the same thing for breakfast most days? For snacks? Is the format of your meals the same? If so, it is time to brainstorm how you can expand your variety. This not only helps to ensure flexibility, but also helps your body get a variety of different nutrients from different foods. For example, chicken is low in iron. If you ate chicken every day, you would be missing out on getting enough iron. Similarly, if you ate an orange every day, you would be missing out on getting the potassium found in bananas. How flexible are you when it comes to food? Due to firmly held beliefs around food or how food should be prepared, someone with orthorexia may struggle to find something to eat when out of their home environment. This mostly plays out in restaurants, on the road, in college, when traveling, at a friends house, at a birthday party etc. One of my clients refused to eat at In and Out Burger on the way home from his soccer game. “I would rather not eat than have fast food,” he said at the time. But it was four hours later until he was able to eat at home. He missed the recovery window post workout, which arguably would harm him more than having In and Out. In fact, sports nutritionists (myself included) would likely agree that given the choice between eating fast food or skipping the post workout meal and eating nothing, it is better for you to eat fast food post workout. Flexibility around food is important. For example, if you run out of quinoa, are you able to eat the white pasta your parents are serving at night? Or if you go to your friend’s house for dinner, and she serves mashed potatoes, are you able to eat it? If you find yourself bobbing and weaving when it comes to food, it is a sign that your flexibility around food might need a tune up. All of your friends are going out for ice cream. Are you able to join them? What if they’re going for ice cream at an odd time that you normally wouldn’t expect to eat? Can you join them anyway? The ability to be spontaneous is a gateway to freedom from rigidity around food. Can you have a bite of food out of turn? OK, you ordered your own entrée but your boyfriend looks over and says, “Yum, this is amazing, try it.” He is eating a Sizzling Beef dish, with a horseradish cream sauce. Can you try it? Does it bother you that it’s an extra bite outside of your entrée? Similarly, can you try your grandmother’s homemade soup when she offers you a spoonful, rather than say no because it’s not officially part of your meal plan? You may have heard that it’s not good to pick and graze throughout the day. But that is not what we are talking about here. We are talking about the ability to try something new, to have fun with food, to try something you might not order, and to be able to have a random bite of food, out of turn, just because you feel like it. Do you have a million specific requests and instructions for the waiter? “Steam the vegetables, put the sauce on the side, no bacon, no butter, a side of lemon, and please add 3 ice cubes in my water with a straw.” Be honest. Do people find it really annoying to eat in a restaurant with you? Usually with orthorexia, a person may have specific food requests about what they want, how they want it prepared, and which ingredients to omit from their order. Can you eat other people’s cooking? You’re running late, have a lot of homework, and your mother offers to cook dinner. Will you let that happen? Or will you insist on being in the kitchen overlooking how she is making it? Do you complain that she is using too much oil? Too much cream? Adding too much cheese? Are you able to attend Thanksgiving without feeling like you need to bring along your own food? Unless you have a food allergy, bringing your own food is a sign that something may be wrong. If fear wasn’t a factor, most people would be excited to have someone else cook for them. Is your food plain and dry? Typically, those with orthorexia, eat a very plain diet. They will say it’s “clean ” but others may say it’s “boring.” A typical meal might be a plain breast of chicken, sweet potato, and a salad without dressing. There is no stir-fry sauce, seasoning, flavor, or herbs. Food is meant to be enjoyed, the combination of spices and flavors bring out the tastes of different ingredients in the dish. For some reason, those with orthorexia may think that sauces are unhealthy and should be avoided. Or that you should skip the salad dressing when eating salad. Really? That sounds like a torturous way to eat. The best way to expand what you eat and how you make foods is to find new recipes. In some cases, using a meal service like Blue Apron, Hello Fresh, Gobble or Home Chef, can push you out of your comfort zone in this area, in a good a way. If you or someone you know is struggling with orthorexia, below are some suggestions to consider. This work is best done with the help of a Registered Dietitian or Therapist who specializes in Eating Disorders. Watch out for this common pitfall. “I don’t like bread, but I would have quinoa.” This might make sense – trading a grain for a grain, right? But this perpetuates the fear of bread. Unless you are not actually scared of bread, in which case, then it might just be a you have a preference for something else. But if it is a preference, you should be “able” to have bread if that’s the only thing being served. Sometimes a person may avoid the bread, but then eat more chicken and broccoli to make up for it. This unfortunately reinforces the fear that something is wrong with eating whichever food you avoided that night. The goal of reducing the orthorexia is not weight gain. The goal is a more expanded palate, more variety, and less anxiety around food. Many people can work on the orthorexic component of their diet while keeping their weight stable. Make a list of your “Safe Foods” and “Fear foods.” What foods scare you? Frequent exposure to that which scares you helps minimize fear. Begin to practice trying some of the foods on your Fear Foods list. Start by making a “food hierarchy” ranking the foods that scare you from least to most. Start with the easier fear foods and gradually work towards more scary foods. Once in trying-new-foods-mode, you will be amazed at how free you feel. If you are a parent, help your child practice exposure by asking him/her to practice eat a variety of foods. As it gets closer to Halloween, households across the country will have an important decision to make: what to give out to their trick or treaters. I have always loved the idea of giving out something else besides candy. 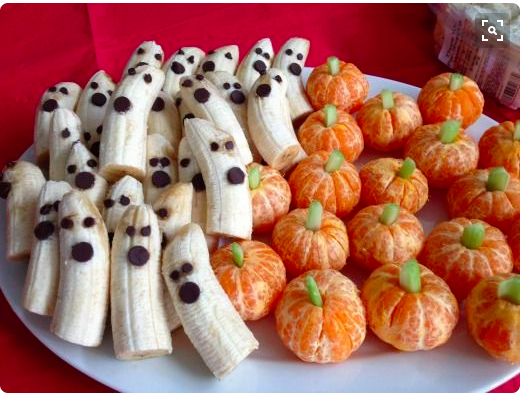 Not because I am against candy, but more because ambitious Halloweeners often come home with so much candy. I’m not suggesting everyone stop giving candy. But would it be so bad if half the houses on your block gave out something else? This of course has to be done though carefully; you don’t want to be that house – the one that gives out pennies and pencils that kids want to skip the next year. Giving out a variety of items year to year shows kids that candy is not forbidden and also broadens their view on what’s fun for Halloween. How about glow in the dark fangs? Imagine herds of kids walking away from your house in the dark and all you see are glow in the dark fangs! Other options could be Hallowe en whistles, glow in the dark sticky stars, jumping, spiders or glow in the dark skeletons that can climb down the wall by themselves (or these glow in the dark skeletons). Glow in the dark sticky eyeballs are fun or Halloween bubbles. The price of these non-candy options are comparable to the price of candy and can actually be cheaper depending on what you get. A 5 pound bag of mini Tootsie Rolls is $10.59 from Costco, which is $0.009 each. But no one ever takes just one, so for two it would be $0.018 per trick-or-treater. A 130-piece assortment of candy made by Wrigley’s (skittles, lifesaver gummies) is $0.10 per item. The Glow-in-the-dark fangs are only $0.08/fang and came in a package of 72 fangs for $6.00. Jumping spiders are just $0.03 each. An pre-assorted mixed bag of non-candy options would be $0.15 per item.. Color scratch bats/pumpkins and spiders are $0.18/item. Glow in the dark sticky eyeballs are $0.21/eyeball. 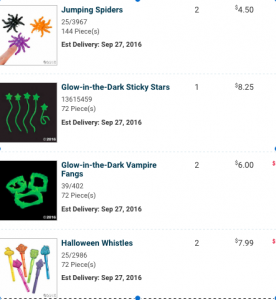 Halloween bubbles are $0.29/item. Happy Halloween toothbrushes are $0.39 but be careful, this could fall in the “pennies and pencils” catergory of boring non-candy options. 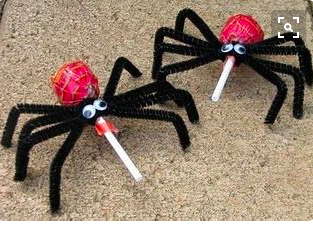 For more fun non-candy Halloween giveaways, check out this Pinterest page. For more options and details on how to make these, check out this pinterest board. Last night, my kids (5 and 3) were thrilled to have wafer cones filled with assorted flavored yogurts, raspberries, blueberries and sliced almonds for dessert. They were laughing as they were layering the different colored yogurts with the fruit, carefully alternating each one, while doing it completely on their own. I began to wonder – at what age will this stop being a fun dessert? High in antioxidants, this is a powerful anti-inflammatory snack for anyone looking to reduce inflammation – whether that’s an athlete in the peak of training, or someone with arthritis. And it is filling. With a variety of monounsaturated fats, different textures, flavors, colors, this snack is not only wholesome but it will satisfy your hunger. Fruit: Raspberries, blueberries, strawberries are a favorite, but anything can work! Dried fruit too! 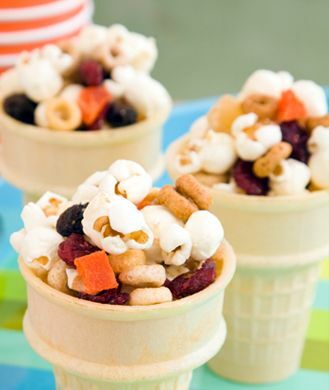 When this gets boring, try adding your favorite trail mix to a wafer cone: mixed nuts, kettle corn, dried fruit etc. You can also blend your favorite frozen fruit with your favorite kind of milk, and make “strawberry ice cream” or “banana ice cream.” Add it right on top of the cone. Of course, you could skip the cone, and just put it in a bowl. But that’s not as much fun. 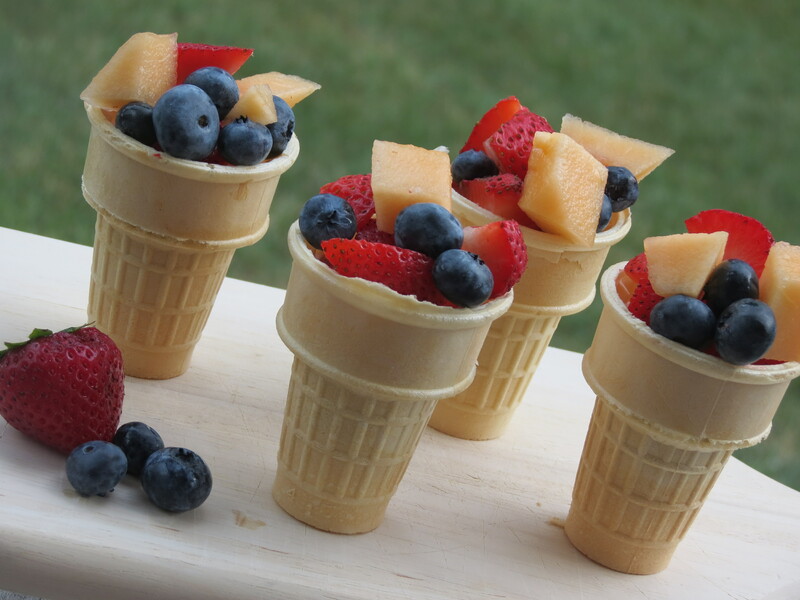 The cones are 20 calories each and add a nice crunch. If you are following a gluten free and/or dairy free diet, try using soy or coconut yogurt. Look for wafer cones that are gluten free (there are several brands) and choose a gluten free granola. After careful analysis, I decided that this snack will always be fun – for any age!